United Airlines and Los Angeles World Airports (LAWA) on February 28 broke ground on a state-of-the-art Technical Operations Center (TOC) at Los Angeles International Airport (LAX) that will enable the airline to provide exceptional service for all of its aircraft fleets. The new facility will include two connected buildings – a ground service equipment and facilities maintenance building and a line maintenance hangar, including an engine support shop that will focus on the aircraft’s Dreamliner fleet. The commencement of this $352 million TOC pushes the airline’s investments at its Los Angeles hub to nearly $1 billion in recent years. The new TOC will consolidate two facilities that United currently operates at LAX that are located a mile and a half apart, improving efficiency with not only moving aircraft around the airport but with transporting employees, parts, tools and other supplies – ultimately leading to a more efficient operation for customers. The TOC will be located near the airline’s terminal and stand at 407,408 square feet. The facility’s hangar will be able to accommodate up to six narrow-body or two widebody aircraft at a time, supporting United’s 150 flights that depart from LAX every day. The TOC will help United’s growing operation in Los Angeles by continuing to deliver an on time, safe and reliable operation. United tapped AECOM Hunt to be the prime contractor for the project, and selected FSB as lead architect for the facility. The airline is also partnering with AvAirPros, which is providing project management services during construction of the TOC. United is also investing in additional maintenance facilities at key airports around the country. Tampa airport authorities recently approved a ground lease for a new hangar that will have room for two Boeing 737 MAX aircraft. The airline is also continuing construction on an expansive new technical operations center at Houston’s George Bush Intercontinental Airport, which consolidates the airline’s maintenance operations in a complex that provides greater efficiency and flexibility. 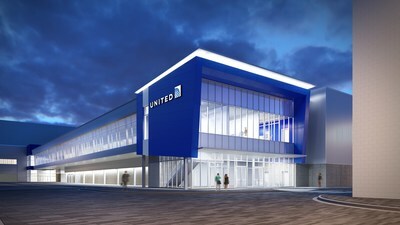 United is also moving into a new hangar in Portland, Oregon and working with the City of Chicago to create a new hangar as part of the O’Hare Modernization Program. This entry was posted in United Airlines and tagged LAX, Los Angeles, United Airlines on March 3, 2019 by Bruce Drum.